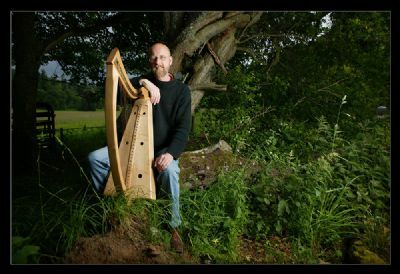 Bill (William) Taylor researches, performs, teaches and records the ancient harp music of Ireland, Scotland and Wales. He is one of very few players interpreting these repertoires using gut-strung medieval harps, renaissance harps with buzzing bray pins and wire-strung clarsachs. Marsharp Music will be publishing a series of books by Bill, for gut and wire-strung harps. The first books were launched in October 2012. Bill performs and records as a soloist and as a member of several groups. In Scotland he plays historical Scottish music with singer and early wind player James Ross in the duo The Art of Musick, and also with the Highland instrumental and vocal ensembles Coronach and Musick Fyne. He has worked closely with singers in Cappella Nova and Canty, accompanying them in performances of medieval plainsong associated with Celtic saints and music by Hildegard of Bingen. He has been involved in several projects with Strathpeffer neighbour Bob Pegg, combining storytelling with traditional and early music. He also accompanies traditional singer Christina Stewart in programmes of lullabies and children's singing games. In Belgium, he performs with recorder player Geert Van Gele and also with their late-medieval quartet Quadrivium. He has joined ensemble Graindelavoix for projects involving late-15th and early-16th century Burgundian composers, and performs medieval music with Sinfonye. He is a leading authority on the Robert ap Huw manuscript, containing the earliest harp music from anywhere in Europe, employing the fingernail technique specified in the manuscript, whilst reading from a facsimile of the tablature and using modern copies of historical harps. Bill has made over 30 recordings as a soloist and with several different ensembles on ASV, CMF, Delphian, Divine Art, Dorian, Gaudeamus, Glossa, Greentrax, Kattenberg, Linn, Maggie's Music, Rhiannon, Rota, Taith and Temple. He is also teacher in residence for Ardival Harps.